Mama knew how to sweet-talk people. Her magic had served her well in McAllen, Texas. And it seemed to be working in our new home in south Louisiana, where employment opportunities were plentiful. She’d even left her first switchboard operator job for a better paying one. “You have to be fast and have a sharp memory,” she bragged on the phone to her friend Marilyn, who’d also moved here from the Rio Grande Valley. “And it doesn’t hurt if you can charm the pants off the meanest customers,” she added with a laugh. The image of an adult without pants made me chuckle, and I exposed my hiding place under the kitchen table. At the age of seven, I had taken spying. Click here to continue reading “Sweet Talk,” a memoir essay published today at Tweetspeak Poetry. This entry was posted in Guest Post for Tweetspeak Poetry, Uncategorized and tagged cnf, essay, lafayette, Louisiana, memoir, RioGrandeValley. Bookmark the permalink. Good morning, Malone. 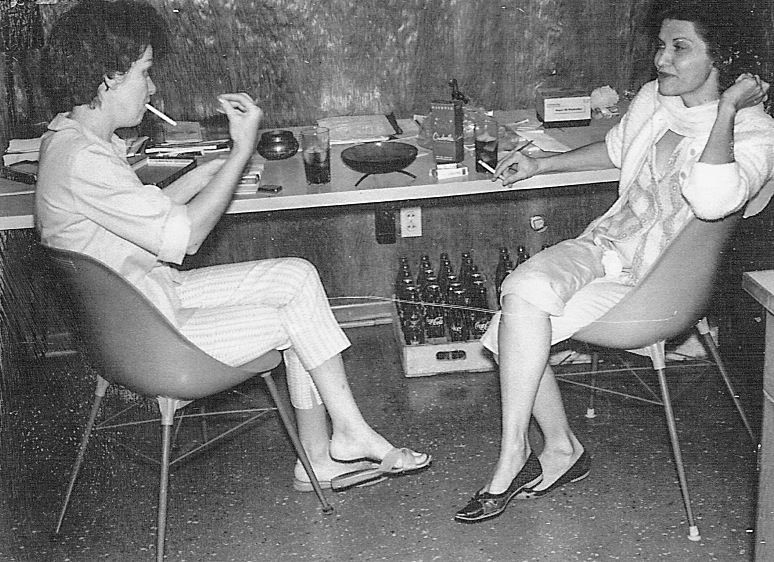 I wish Mama still had that ashtray. And those chairs! I LOVE your writings Darrelyn! Love the pictures! They certainly take me right back to those moments from my past. I have one of my mama and her friend at the same table, believe it or not…..smoking, of course! And I was right there with you under the table….and in some hidden place….always listening/often so afraid of what was going to happen next. Thank you for ‘going back there’ and retrieving those memories, albeit so sad and scary, at times, and yet beautiful memories with your sisters (I have 3 and so many sweet memories)!!!! So many painful memories from those past days, but I believe they have built strong character in us. Thank you again and keep those memories coming!! !